Preliminary notes. 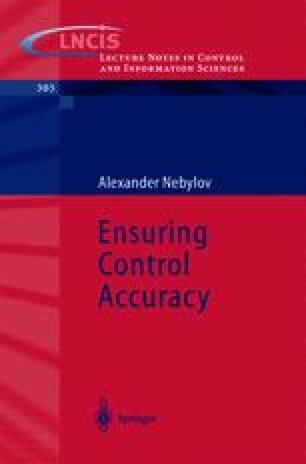 Considering the accuracy of control systems as the major quality characteristic of its operation, it is natural to first require the acceptable value for selected precision factor when realizing the dynamic synthesis of a system. An average quadrate or the dispersion of error can be used as such a factor only in a case when the spectral densities of input actions are given. The smaller a priori information causes the necessity to use the rougher accuracy characteristics. As it is shown in the chapters 5 and 6, rather small amounts of a priori information is required for calculation of the upper-bound estimate of error dispersion or maximum error. It provides the foundation to set the problem of robust dynamic system synthesis at partially unknown characteristics of input actions. In the first case the problem is: the synthesis on dispersions of action and its derivatives or on other generalized moments of action spectral density, in the second case — on maximum absolute values of action and its derivatives.